Your security is important and will always be one of our highest priorities. We take every step possible towards building a secure platform that your company can use with confidence. We are always in compliance with the PCI Data Security Standard. Credit card information is never stored and all transactions are performed over SSL. Make accounting and invoicing a breeze! 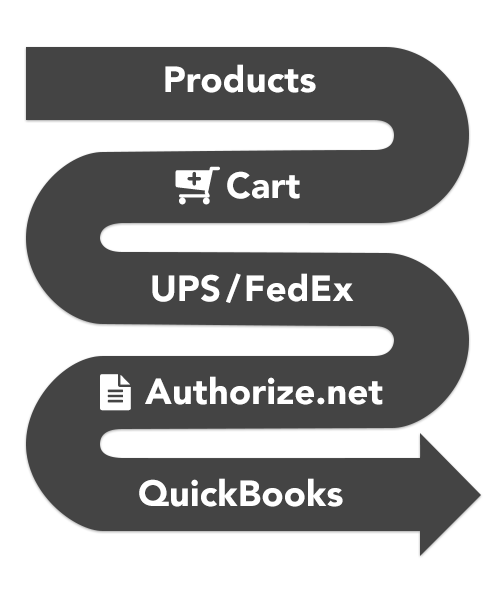 We can seamlessly integrate Quickbooks into any E-commerce platform so you can keep track of your business. Completely automate the checkout process by allowing your customers to promptly receive shipping costs based on their location. Increase revenue and customer confidence by accepting credit cards and implementing custom fraud protection. More and more devices are shipping with the ability to browse the web. Nearly 50 percent of Google searches are performed on a mobile device, and that number continues to grow. All of our projects are built with the future in mind. Your customers will be able to enjoy the same, high quailty expierence on any device or screen size.